The movie is set in the year 2033, after a meteor has struck the Earth, creating a global desert. "You gotta squeeze 12 in a bathtub," Tank Girl tells us in the opening narration, "...so it ain't all bad." The planet is mostly ruled by the evil Water & Power Co., run by a madman named Kesslee (Malcolm McDowell), who controls most of the water supply and whose name is possibly a misspelled anagram of "leaks." Living outside the W&P sphere is a small group of self-sufficient desert rats, who pump water by hand to grow hydroponic crops. 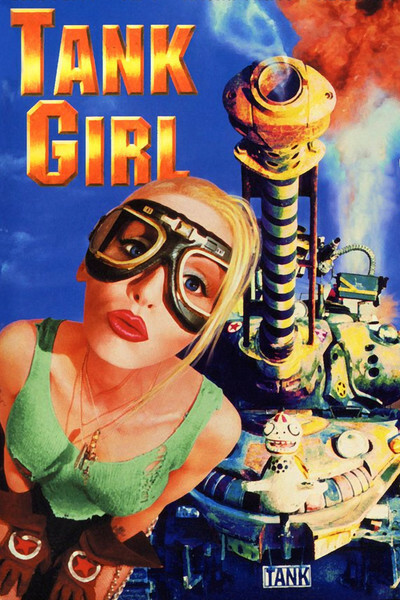 Tank Girl (Lori Petty) is one of their number, and when Kesslee's troops attack the commune, she wipes out eight of them before she's hauled before the evil monster himself. McDowell, who has specialized lately in weirdo villains, thinks she might be useful in his war on the Rippers (anagram of Sippers? - oh, never mind). They're kangaroo-men who were developed in a DNA experiment, as Ultimate Soldiers: They're smart as men, can hop like crazy, and always have a place to keep their grenades. (The actors playing them, including Ice-T, are a little easier to identify than the stars of "Planet of the Apes.") Some Rippers remember life before their DNA got manipulated; one solemnly tells Tank Girl, "I used to be Ted Smith, assistant manager of Chief Auto Parts in Cincinnati, Ohio." Tank Girl refuses the chance to work for Kesslee, and after making a friend of the shy Jet Girl (Naomi Watts), she wages war against Water & Power, in scenes involving lots of machine guns, tanks, planes, grenades, electrocution, and even a weapon that is plunged into the victim, draining his blood while simultaneously purifying it into water. Under the direction of Rachel Talalay, the movie plunges headlong into technique. Some of the locations, like the desert commune, are obviously scale models. Others are elaborate sets, including the dark satanic mills where Kesslee sets his slaves to work. Tank Girl careens through this landscape with an evil snicker and incredible good luck, dodging death and causing a lot of pain to the genital areas of her enemies. She talks back to her captors ("Hey! I have two words for you: Brush your teeth!"). She smiles at the camera in a heroically gratuitous Busby Berkeley dance routine. And of course she prevails. Enormous energy went into this movie. I could not, however, care about it for much more than a moment at a time, and after a while its manic energy wore me down. Director Sidney Lumet has a new book out about how to make movies. In it he observes that slowly-paced scenes can actually make a movie seem to go faster than a relentless pacing that never stops.